Pamela E. Ferris (born 11 May 1948) is a Welsh actress. She starred on television as Ma Larkin in The Darling Buds of May, and as Laura Thyme in Rosemary & Thyme, Peggy Snow in Where the Heart Is and has played parts in family films based on works by British authors, such as Miss Trunchbull in Matilda and as Aunt Marge in Harry Potter and the Prisoner of Azkaban, and most recently as Sister Evangelina in Call the Midwife. Ferris performed in her younger years at the Mercury Theatre in Auckland, and later with various regional companies in the UK. She played motherly Ma Larkin in the ITV series The Darling Buds of May, which ran from 1991 to 1993. She has also acted in a succession of television dramas, including Meantime, in which she played the Cockney mother of Phil Daniels and Tim Roth, Connie, Hardwicke House, Oranges Are Not the Only Fruit, Where the Heart Is and Paradise Heights. From 2003 to 2006, she played the gardening sleuth, Laura Thyme, in Rosemary & Thyme. Her roles in costume dramas include parts in television adaptations of Middlemarch, The Tenant of Wildfell Hall, Our Mutual Friend, The Turn of the Screw, Pollyanna and Jane Eyre. In 1996, Ferris portrayed the brutish, authoritarian school headmistress Agatha Trunchbull in Matilda. In 2004, she played the callous Aunt Marge in Harry Potter and the Prisoner of Azkaban. In 2006, Ferris took on the role of Miriam, a motherly activist in Children of Men. She has also acted in productions for BBC Radio 4. Her career in the theatre has included parts in Royal Court Theatre and National Theatre productions. In 2007 she played Phoebe Rice in an acclaimed revival of John Osborne's The Entertainer at London's Old Vic Theatre. In 2007, Ferris took part in the BBC Wales programme Coming Home about her Welsh family history. In 2008 she played Mrs General in an all-star cast BBC adaptation of the Charles Dickens novel Little Dorrit. From 2009 to 2010, she appeared in the final series of the BBC comedy Gavin & Stacey as Cath Smith. In 2010, she made a guest appearance in the sitcom Grandma's House. From 2012-2016, Ferris played the part of Sister Evangelina in the series Call the Midwife. She chose to leave as filming was moved to a different area and the extra journey time was too stressful. In June and July 2015 Ferris was the guest of Sarah Walker on BBC Radio 3's Essential Classics. Ferris was born in Hanover, Lower Saxony, Germany, to Welsh parents, while her father was serving in the Royal Air Force. After her parents returned to Wales Ferris spent her childhood in the Abercynnfig area, near Bridgend. Her father, Fred Ferris, was a policeman, and her mother, Ann Perkins, worked in her family's bakery business. In 1986 she married actor Roger Frost. She lives in Elham, Kent, South East England. ^ "Mercury Theatre Records (1966–1990)". Auckland City Government. Archived from the original on 24 July 2008. Retrieved 27 August 2008. ^ "Monday - Sarah Walker with Pam Ferris, Essential Classics". BBC Radio 3. BBC. Retrieved 16 September 2017. ^ ltd, company check. "MS PAMELA FERRIS director information. Free director information. Director id 902329745". Company Check. Retrieved 16 September 2017. 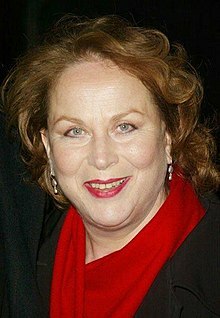 ^ "Coming Home: Pam Ferris". BBC News. BBC. 12 March 2007. Archived from the original on 19 September 2007. Retrieved 16 September 2017. ^ "'Darling Buds of May' star back in Kent high life". Itv.com. 7 June 2015. Retrieved 16 September 2017.